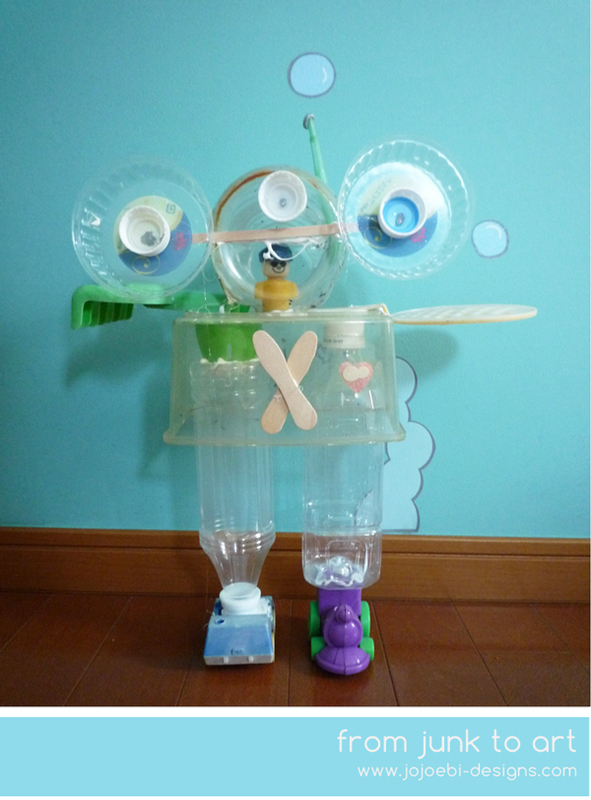 Ebi-kun was inspired by the sculptures that we saw at the Muji exhibit the other day and wanted to make his own. I saw this as opportunity to get rid of all the junk in the yard! Our yard isn't very big and doesn't have any toys as such, unless you include shells, sticks and stones which are great toys if you as me. We do have some crappy old plastic toys that came from family restaurants and various other bits of crap that have been played with at some stage and then forgotten about. So when we watered the plants in the morning we collected up all the junk and gave it a wash down and let it to dry in the sun, that took about 20 seconds, it is too hot here at the moment. 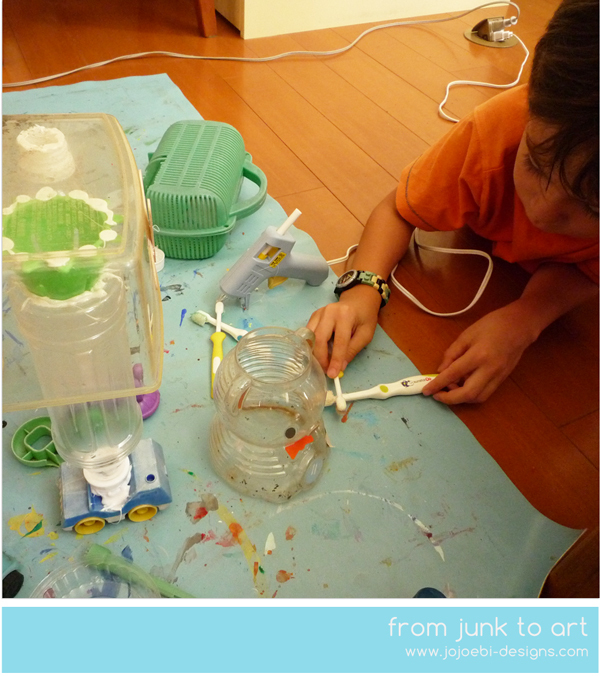 Then in the afternoon I piled everything onto a tray and bought it inside, dumped it on the splash mat, handed Ebi-kun the glue gun and let him go at it. He decided to make a robot and he did need a third hand at times, a third hand that he managed to glue with the low temp hot glue gun twice, although it is hot and it hurts a bit it isn't hot enough to actually burn the skin. He spent about an hour and a half working on it, a couple of pieces were glued on then he changed his mind and pulled them off again and he was going to use the toothbrushes for arms but decided against it. I enjoy sitting back and watching his thought process. He named his finished piece as Gomita, gomi is rubbish in Japanese, it was going to be Junkie which is cute but considering it's meaning, not really suitable so I had to explain what a junkie was, he then thrashed out a load of other names before deciding on Gomita. Ebi-kun has to hand in a project that he did over the summer so he is thinking of taking this and will write why he made it and a back story for the robot. I'm not sure if this is the kind of thing the school expects since it is the first time we have had to do it, we will see! Do you kids have to do school projects over the holidays, if so what kind of thing do they make? Love this! Some of my favorite pieces of artwork I created when I was younger are "trash" art." I really love finding trash on the beach or side of the road and making it into artwork about not littering. 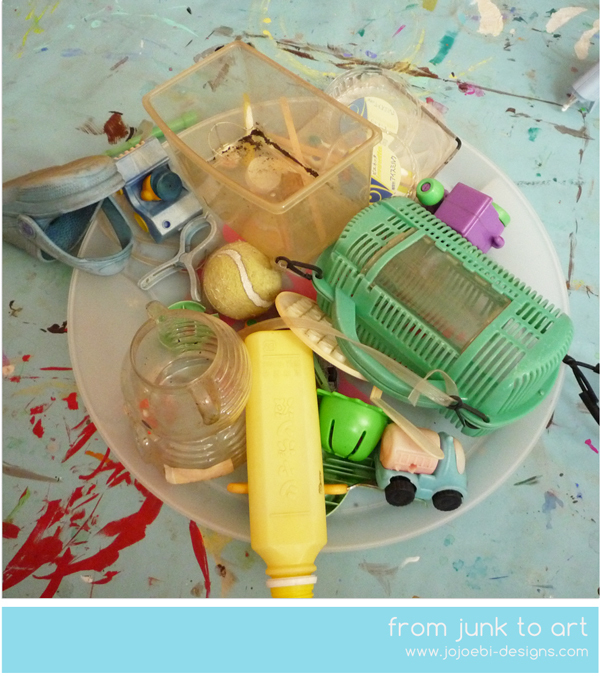 I think it is a great way to tackle the littering problem and making art with beach finds is always a great idea. Better they get used to you up front! Great project! lol. yep, a friends kids always got good marks for their projects because she used American craft books for her inspiration so the projects stood out from the usual run of the mill ones - something to keep in mind! organized projects are great but just letting them roll with it and make what they want is fab. It is always interesting to see what they will come up with next.